“When are you going to tell me where we’re going to dinner?” Elizabeth asked as the Darcy family’s Mercedes passed through midtown Manhattan. Neither Elizabeth nor William had said much on the drive uptown. Elizabeth had been content to sit quietly, enjoying the warmth of his arm around her shoulder. Things had changed between them since his trip to Chicago, and she needed time to process the flood of unnerving feelings aroused by his presence. His house? No doubt in a huge, stately dining room with haughty servants everywhere, and perhaps his grandmother dropping by to see if I know which fork to use. Or else he’s sent everyone away, and after dinner he’s planning to have me for dessert. Elizabeth’s vague feelings of unease were instantly magnified, and she stiffened. The car pulled up in front of the townhouse. 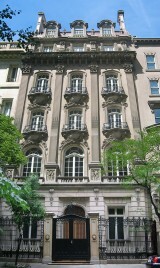 Elizabeth stepped out onto the sidewalk, admiring the stately limestone building with its large windows and ornate balconies. She craned her neck to see the higher floors. “Clever fellow.” She was fascinated by the energy and enthusiasm in his voice as he told the story, in sharp contrast to his usual reserved demeanor. The front door swung open, and Elizabeth found herself face to face with a slightly plump, grandmotherly woman with silver hair and wire-rim glasses. She wore a simple black dress, a string of pearls, and a warm smile. Mrs. Reynolds led them into the house. The reception area was small but impressive, with an ornate table in the center holding a massive floral arrangement, and a large gilt-edged mirror on the wall that was obviously, even to Elizabeth’s untrained eye, an antique. The lofty ceiling made the area seem even larger than it was. Through an arched doorway, Elizabeth saw a spacious living room. “Excuse me, Mr. Darcy?” Mrs. Reynolds said. “She’s still here?” William frowned. “It was a sweet gesture.” Elizabeth couldn’t help but be impressed by Mrs. Reynolds’s obvious affection for William. Elizabeth looked around her in awe as they passed through the living room, with Mrs. Reynolds leading the way. A huge fireplace with an ornate hearth dominated one wall. Oriental rugs covered portions of the beautiful hardwood floor. The room was furnished in antiques, and Elizabeth guessed that most of them had been in the family for several generations. When they entered the library, Elizabeth gasped. It was designed to answer the prayers of any book lover: two stories high, with a gallery at the second level to allow access to the upper bookshelves. The wood-paneled walls gave the room a rich, warm appearance. Floor-to-ceiling windows along the back wall created a dramatic effect, offering views of a small garden behind the house. “What a beautiful room!” Elizabeth exclaimed. “Oh?” This sounded like a clue to the real William Darcy. Elizabeth smiled her thanks and decided to take Mrs. Reynolds’s suggestion. She exited the library and stepped onto a small brick patio behind the house. The garden was compact, but it offered a pleasant oasis in the midst of the city. She needed to stop jumping to conclusions about William’s world. His house was somewhat overwhelming, as she had anticipated, but Mrs. Reynolds was the antithesis of the haughty, stiff servants Elizabeth had expected to find. She turned to look back at the house and noted a series of balconies on the upper floors, terraced so that the lower-floor balconies were uncovered. One of them undoubtedly belonged to William. She wondered where he was, and what he was thinking, at that particular moment. After dispensing with his business with Sonya as quickly as possible and sternly ordered her not to “accidentally” bump into Elizabeth on her way out of the house, William went upstairs to inspect his bedroom, quadruple-checking that it was ready for a visitor. Just in case. He studied his reflection in the dressing room mirrors, straightened his black bow tie, and took a deep breath to calm his jittery stomach. Please, please, don’t let anything go wrong tonight. Turning resolutely on his heel, he strode into the hall and descended the stairs to the first floor. As he passed the kitchen, he nearly collided with Mrs. Reynolds, who was carrying a small tray with two glasses of wine. “William!” she exclaimed, struggling to keep the glasses from spilling. He nodded, not trusting himself to say anything. Mrs. Reynolds had mostly broken the habit, formed during his childhood, of using endearments when speaking to him, but occasionally one still escaped. William didn’t mind, as long as she was careful to address him formally when outsiders were present. He passed through the doors from the library to the garden, juggling the wine glasses. Elizabeth stood off to one side, bending over a rose bush to inhale the scent of one of the blooms. “I’m so sorry to have kept you waiting,” he said. “It’s small, but I’ve always liked it.” He handed her a glass of wine. They stood together on the small lawn, silently sipping their wine. The sun sat low in a sparkling blue sky, with a few clouds visible between the tall buildings surrounding them. The fragrance of the shrub roses mixed with the smell of the freshly-mowed grass, creating the unmistakable scent of summer. “I’m glad you brought me here for dinner,” she said, breaking the silence. Her eyes softened as he continued to caress her cheek. It was Sonya’s voice. Elizabeth sprang away from him and studiously examined the rosebushes. William pivoted on his heel and faced his secretary, grinding his teeth. “I thought you had left,” he said curtly. Elizabeth greeted Sonya, and they began to chat. William was far too frustrated to concentrate on what the women were saying, so he contented himself with glowering at his studiously oblivious secretary. “Nice to meet you!” Sonya called out over her shoulder as William propelled her forward. “And?” He asked the question with deliberate sarcasm, hoping to hide his interest in Sonya’s impressions of Elizabeth. “Well, I didn’t get to talk to her for long, what with you dragging me away so soon.” She smirked at him. He shook his head in long-suffering silence. Sonya departed, and William made his way through the house, a lopsided grin turning up the corners of his mouth. He found Elizabeth in the library, scanning the bookshelves. Of all the rooms on the second floor, Elizabeth liked William’s office best. It was decorated in dark, rich colors and, like the living room, was furnished in antiques. “You can feel the history in here,” she breathed. William smiled at her, dimples creasing his cheeks, and her heart did a peculiar flip-flop in her chest. He led her slowly around the room, showing her his collection of antique maps and globes. She was touched by his almost childlike pleasure in sharing these prized possessions with her, and she made an effort to draw him out further by asking questions about the maps. She watched him gazing up at his mother in the portrait, and saw a bittersweet smile on his lips. “I’m sorry,” she whispered, touching his arm. His dark eyes fell on her, seeming to peer into her soul. He took her wine glass, set it on the hearth, and took her hands in his, drawing her closer to him. “Elizabeth,” he murmured. A thrill of anticipation streaked through her as he leaned forward, his lips descending toward hers. She stepped away, stumbling over the edge of the rug but managing to regain her balance. Allen Reynolds stood in the doorway, a wine bottle in his hand and a stricken look on his weathered face. Allen set the bottle on the nearest table and all but sprinted from the room. William turned to Elizabeth, his brown eyes mournful, the corners of his mouth curling down. His pitiful expression was the last straw; she could no longer contain her giggles. “I’m sorry,” she said, “but it’s just—” She burst out laughing, unable to finish. And to think I was worrying about being alone with him! “Sometimes I wish I lived in a cave in Tibet,” he grumbled, but she saw a faint twinkle in his eye. A smile gradually stole across his face, and he began to chuckle softly. “I hope so.” They smiled at each other. “Oh.” Me and my big mouth. How do I get out of this? 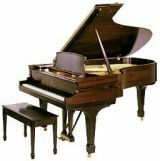 The climbed the steps and entered his sitting room, where a baby grand piano in a beautiful rosewood case dominated the space. “It’s beautiful,” she breathed, running her fingers over its polished surface with reverence. “I bet it sounds wonderful. Would you play something for me? “So I can turn your invisible pages again?” she asked, grinning, as they seated themselves. He sat quietly for a moment, studying the keys, and then began to play. This piece was gentler and more contemplative than the stormy compositions with which he was so often associated. Its plaintive melody sang out, piercing her heart with its sweetness. As was typical when he played, he seemed to escape reality and slip into the world of his music. She felt herself being pulled along to a place of rare beauty as the music ebbed and flowed around her, forging a bond between them that she didn’t understand, but was powerless to resist. William lifted his hands from the keyboard as the final chord of the Brahms Intermezzo1 shimmered in the silence and then faded away. A passing car backfired, yanking him back into the present. He turned to Elizabeth and was astonished to see tears in her eyes. “What’s wrong?” He reached out and captured a teardrop as it rolled slowly down her cheek. Their eyes locked, emotion surging between them. They leaned toward each other and their lips met, tentatively at first, but the urgency escalated rapidly. Elizabeth moaned softly and her arms curled around his neck. She pressed closer to him and he shuddered with desire, her eager response inflaming him. His tongue teased her lips, probing gently until her mouth opened under his. Groaning deep in his chest, he wrapped his arms tightly around her. Fierce hunger electrified William’s nerve endings, and as the kiss continued he thought repeatedly of his bedroom, his private sanctuary just a few steps down the hall. His few functioning brain cells argued that the time wasn’t right, that it was too soon, that he needed to maintain control, but his ravenous body refused to listen. Finally, reason triumphed over desire, and he forced himself to break off the kiss. They sat together, foreheads touching, eyes closed, still clinging to each other, the silence broken only by their shallow breathing. Nothing in William’s experience had ever come close to the wave of pure joy he had felt when she yielded her mouth to him. He saw in her eyes that she too was shaken by the emotion that had flared between them. He kissed her tenderly and drew her head onto his shoulder, caressing her hair. Finally, he felt her stirring, trying to sit up straight, and he reluctantly released her. She passed through the doorway without a backward glance. His lips curled into a lazy grin and he closed his eyes, basking in the memory of that incredible kiss. But in three days, she was leaving. His smile faded. Elizabeth peered into the dressing table mirror in William’s bathroom and took a deep but unsteady breath. She repaired her lip gloss, and task made difficult by her trembling hand. What on earth just happened? One moment, he had been sweetly concerned about her tears; the next, they had been locked in the most passionate embrace Elizabeth had ever experienced. A shuddering warmth had filled her body, leaving her weak and trembling, able to do little but cling to him in helpless surrender. She ran a finger along the marble top of the dressing table. It was a beautiful piece, but seemed incongruously feminine for a man’s bathroom. He must have installed it for his girlfriends to use when they slept over. Considering all the women who must throw themselves at him, she was sure he rarely spent a night alone. Which explains why he’s so good at kissing. Lots and lots of practice. Her smile faded, and she rose from the table, surveying the room, which felt—and perhaps was—as big as her entire apartment. It was decorated in deep, warm colors, creating an impression of masculine comfort and luxury. She noted the huge glass shower stall and the long expanse of countertop, but it was the whirlpool tub in the corner that caught and held her attention. She sighed wistfully, imagining herself lounging in the tub, surrounded by a sea of fragrant bubbles. Needless to say, with a glass of champagne in my hand. But she was feeling like herself again, and it was time to rejoin William. After one final admiring look around the palatial bathroom, she exited into the hall. He was waiting by the stairs. “Is everything okay?” he asked. When they emerged from the elevator onto the sixth floor, Elizabeth remembered Mrs. Reynolds’s advice and glanced up at the painted dome over the stairs. William beamed with pride when she commented on its beauty, and then, with an air of anxious anticipation, he led her through a set of French doors into the greenhouse. They were surrounded by lush greenery punctuated by a profusion of orchids in an endless variety of colors and sizes. She inhaled the warm, humid air, fragrant with damp earth and green, growing things. He nodded but didn’t answer. Elizabeth wandered down the rows of plants, admiring the delicate blooms. William pointed out some of the most unusual plants, and discussed care and cultivation. Her heartbeat quickened as he stepped closer. “Thank you for coming to my house,” he murmured, placing his hands on her shoulders. She closed her eyes, feeling his warm breath on her cheek as his lips descended to meet hers. The teenager Elizabeth had noticed at the Juilliard reception sauntered toward them. She was tall and thin, with shoulder-length light brown hair and soft blue eyes. She wore faded designer jeans, a snug-fitting pink top, and sneakers with thick soles. Other than her height, she bore little resemblance to her brother. “Hi,” Georgiana said with a nonchalant air. “That’s an awfully tough comparison,” Elizabeth answered with a quick smile at William. “What instruments do you play?” She knew the answer already, but it was as good a topic as any. “Georgie is second chair violist with the New York Youth Symphony,” William interjected with pride. He didn’t answer. They continued their stroll through the greenhouse. Elizabeth turned to see Rose Darcy approaching. “Gran! I wasn’t expecting to see you until later.” William’s lips twitched, and Elizabeth had to work hard to suppress a giggle. “Excuse me, Mr. Darcy?” It was Marcia Reynolds, passing through the French doors bearing a tray laden with dishes. “Of course, Mrs. Darcy. That would be lovely.” Elizabeth did her best to sound sincere. “We can only hope.” She took his hand and squeezed it. William leaned back in his chair, sipping his coffee, and marveled at how relaxed he felt. From the moment he and Elizabeth had seated themselves at the table in the midst of the roof garden, the evening had progressed flawlessly. Dinner had been a triumph of Mrs. Reynolds’s culinary skill, the wine he had chosen was superb, and the weather had been perfect for dining al fresco: warm enough for comfort, but not oppressively so, with a gentle breeze. The sun had set near the start of dinner, streaking the sky with improbably vivid color, and a nearly full moon now rode above their heads. Traffic noises drifted up from the city below, but as was typical of a seasoned New Yorker, William barely noticed the sounds. Besides, they were masked in part by soft jazz music, which he had carefully selected that morning. Even his reflections on the early part of the evening were pleasant now, in his current benevolent frame of mind. Instead of dwelling on the constant stream of interruptions, he reflected with satisfaction on the pleasure of sharing his home with Elizabeth, and above all on their passionate interlude in his sitting room, an experience that he hoped to repeat, and perhaps improve upon, later that evening. Elizabeth was finishing her dessert, a blissful expression on her face. Her skin glowed in the candlelight. He wished for a moment that he were a painter instead of a musician so that he could capture the moment on canvas. Their eyes met in a long, unsmiling look. In the silence that followed, a familiar song began to play on the stereo. Elizabeth’s eyes widened in recognition. His insides clenched. She’s guessed what I did. He briefly considered confessing the truth. No. It would hurt her pride to know why she was hired. “Really? What were the odds?” he asked, rolling his eyes. “Because … no, never mind.” A memory of Elizabeth kissing Bill on the cheek at the rehearsal dinner, and later of her leaning over his shoulder when he sat at the piano preparing to accompany her song, flashed into William’s mind. “When my interests lie elsewhere,” he said boldly, his eyes caressing her. She smiled but averted her eyes, staring at her empty dessert dish. The sound of Duke Ellington’s orchestra flowed through the speakers. William rose from his chair and held out his hand. She stood up and placed her hand in his. He drew her close, and they began to move together in time with the music. “Are you sure we should be tempting fate this way?” she asked. “What do you mean?” He was both perplexed and delighted by the playful light in her eyes. Elizabeth looked up at the night sky. “What’s wrong?” he asked, also glancing up. They laughed together as they continued to dance. Her green eyes sparkled with mirth, and her laughter was as sweet as any music he had ever heard. “You make me happy,” he whispered. Elizabeth sighed and nestled close to him. Her hair felt soft against his cheek, and he inhaled her scent, slowly breathing in her essence. He tightened his arm around her waist, savoring the light pressure of her body against his, and they swayed to the music as a saxophone moaned a sensuous melody. He wanted only to go on holding her like this forever, to envelop himself in the warmth of her presence. He kissed the top of her head, and she looked up at him, her eyes soft and luminous. “This song. Isn’t it ‘Prelude to a Kiss’?”3 she asked. He nodded and lowered his head toward hers. “Quite apropos, I think,” he murmured against her lips. Marcia Reynolds exited the elevator onto the sixth floor and approached the doors to the greenhouse, humming to herself. Everything was going wonderfully this evening. Elizabeth Bennet was charming, and she and William appeared to be having a lovely evening, judging from the happy look on her boy’s face when she had served the various courses of their dinner. Now it was time to collect the dessert dishes, and to see if they wanted more coffee or perhaps an after-dinner drink. If only Allen had been more careful earlier! He had returned to the kitchen, red-faced and flustered, explaining that he had interrupted a tender moment in William’s office. Men! They’re like bulls in china shops, all of them, lumbering around without paying the slightest attention to what’s going on. She stepped into the garden and saw immediately that the table was unoccupied, but it took a short time for her eyes to fully adjust to the darkness. At last, she saw them standing in the shadows, wrapped in each other’s arms, in the midst of an intimate kiss. A smile formed on her lips as she drank in this romantic sight. Unfortunately, her attention was diverted, and she bumped into the dinner table, causing the dishes to rattle noisily against one another. Marcia winced, standing helplessly beside the table, but William and Elizabeth were too engrossed in each other to notice the sound. She silently retraced her steps to the greenhouse and slipped through the door. The dishes could wait. And as for more coffee, somehow I don’t think they need anything but each other right now. 1 Intermezzo in A, Opus 118, No. 2, by Johannes Brahms. Performed by Daniel Pollack on First Kiss, © 1996, Four Winds Entertainment. Listen to a sample on iTunes. My favorite version was recorded by Van Cliburn, but it’s not available on iTunes and Pollack’s interpretation is similar. 2 When I Fall in Love (Young/Heyman). Performed by the Bill Evans Trio on Portrait in Jazz. © 1959, Riverside Records. Listen to a sample on iTunes. 3 Prelude to a Kiss (Mills/Gordon/Ellington). Performed by Duke Ellington and his Orchestra on Duke Ellington: 16 Most Requested Songs. © 1994, Sony BMG Music Entertainment. Listen to a sample on iTunes.